As I’ve continued to work on the physics portion of this site, I’ve encountered some difficulties with finding images. Back when I first started biologycorner.com, clip art sites and image resources were everywhere. It was almost as if the internet of 1996 existed solely to supply clipart to the masses. In fact, many of the images on biologycorner.com came from sites that no longer exist. Now, when I look for clip art, I find myself consistently looped back to sites that require pay subscriptions, or in some cases a single fee to license an image for a site. There are still some places out there that only require a link back if you use their images, but they seem to be hidden in the massive amount of pay sites that google has top rankings on. I’ve listed a few of my favorite sources in the Images Section of this site. Another source I’ve found is flickr, though you do need to be cautious about using images there. Not all of them are licensed as CC (creative commons). To get the little images on the physics page that go with the topics, I used a flickr search tool to help locate only those images that are CC licensed. As an aside, you can also license your own work with this method. The Creative Commons website has information on how the license works and what kinds of licenses you can choose for your own work. Incidentally, this site’s resources are licensed under this type of copyright. The tool I use to search for images for the new physics site is Compfight, though you must choose to only search for images with a CC license. What type of images you are looking for should guide your search terms, but this can also be a difficult and time consuming process. For the next section of my site, a chapter on work and energy, I started with a search for tools. Apparently, not many people take pictures of their tools and the ones that I did find were boring, static images. Since I want the physics site to illustrate the dynamic and exciting world of physics, I need to find images that “move”. I had to think of what type of tools qualify and decided to look under heavy equipment. This yielded images of tractors and cranes more exciting images. 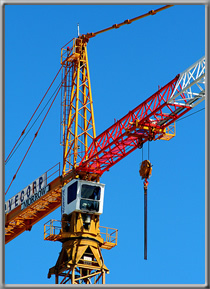 I chose a picture of a crane from the image list, and a click took me to the photographers flickr site where I could get his information. I need his name and photostream address to properly attribute the photograph when I post it. It is also considered a courtesy within the Flickr community to let the photographer know that you are using the image. Here’s a tip for images you download from flickr. Once you have the image on your computer, right click and go to properties; in the “comments” tab, paste the photographer’s flickr link. I made the mistake of not doing this at first, and ended up with a pile of photos that I could not find their photographer information to give them credit. Now if you go to the biologycorner.com/physics/ you can see that each of the photographs I’ve used has a flickr credit underneath it. I’ve uploaded a few pictures of my own to flickr, you can view my photostream to see random pictures of classrooms, labs, students, and of course, my dog. If you are going to use flickr as an image source, I encourage you to post a few of your own to share with others, even if you think its a silly picture, post it anyway. I am constantly looking for the obscure image to go along with some weird worksheet or resource. Wikimedia commons has grown a lot over the years, that is a good place to start to find images that are licensed for public use. There are many science images available and most do not require attribution. This bacteria cell drawing was found at wikimedia.